There’s nothing formulaic about Lori Rader-Day’s academic mystery, The Black Hour. The 2014 mystery from Seventh Street Books is a dark gritty look at the power differential between professors and students and, especially, the deadly consequences that can result from abuse of that power in academia. It is filled with insight into the dynamics of healing from trauma and the fascinating ways both professor and student confront and/or rationalize blatantly unethical behavior. Writing mysteries feels like driving a coach with four feisty horses under my reins: my two sleuths, Kyle and Lyssa; the killer; and the victim. Letting each of them have their heads would mean disaster, but they’re the force that propels the story. My job is to keep them working together. No wonder my hands hurt all the time! This photo shows book two of The Penningtons Investigate, obviously a work in progress. The 20 chapters are drafted, and I’ve just done a critical read-through and chapter-by-chapter analysis, noting flaws, missed opportunities, development of the character arcs (his, hers, and theirs), progress of the investigation, and so on. I didn’t do that for book one, but my wonderful editor did. I humbly learn with each book. 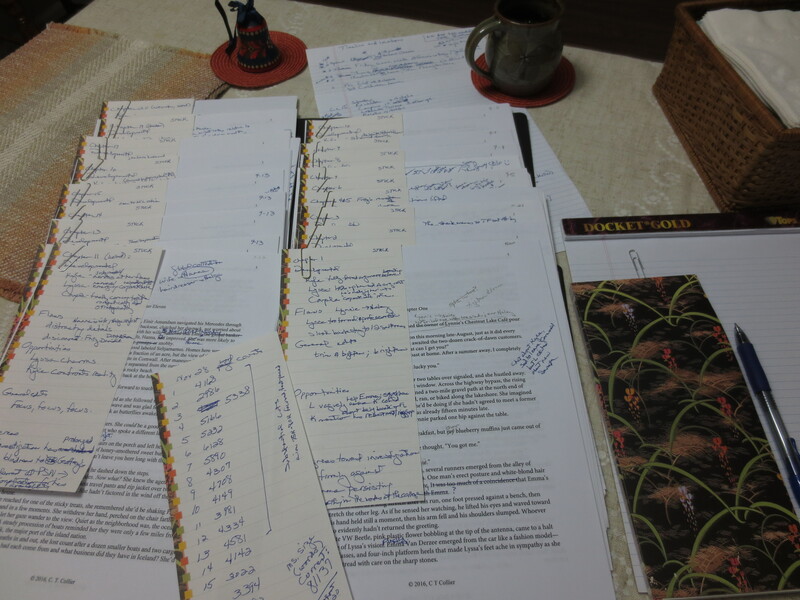 The plan is to have the full revision in the hands of my wonderful editor and my beta readers by year’s end. I’ll bet your process is different, isn’t it? I’d love to hear your thoughts!